An exterior view of France Delice Cafe. 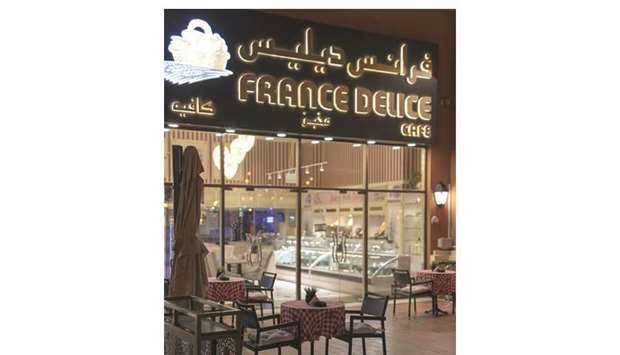 France Delice Cafe, a French concept bakery and pastry shop at Medina Centrale in The Pearl-Qatar is in great demand for its novel concepts and items. “We started as a bakery and pastry shop some eight months ago and we have recently expanded our services into a restaurant serving meals. At our bakery, we serve French concept items while our restaurant serves national food items,” said Ahmed Ramadan, manager of the restaurant and bakery. “There is a great demand for our restaurant items. Our breakfast is very popular in the area.We serve national food items and one special thing about our restaurant is that these items are available not just for breakfast but all through the day,” explained Ramadan. “We sell several items such as salad, pasta and other items for lunch and other meals. Our juices are very special and there is great demand for them. All our products are moderately priced and our bakery and pastry items are all made in-house,” said Ramadan. “We started as a bakery and pastry shop. Still, we are the only bakery in Medina Centrale. Our French bread is very famous all across the area. Several people visit us daily from all over Pearl Qatar just for the bread. We make croissants as well as chocolates. We also provide cheesecake and caramel,” said the bakery manager. France Delice Cafe is also planning to cater food outside. “We are planning to supply our bread to other shops in Pearl and other places. We are open from 7am to 11pm on weekdays and from 7am to midnight on Fridays,” added Ramadan.